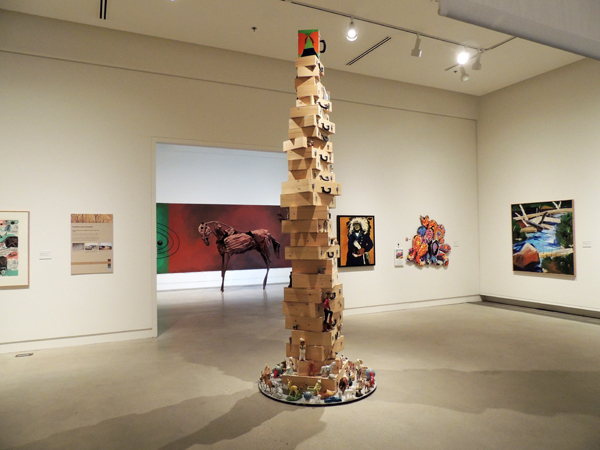 Childhood (Lost) (2010) Missoula Art Museum, September-December, 2011 wood, paint, hardware 147"x47"x47"
In 2006, I was contacted by Ronald Sanders, a teacher at the elementary school my brothers, sisters and I attended in Amsterdam. Sanders was organizing the 80th anniversary of the school and the focus of the 2007 reunion was to be on the effects that World War II had on the school--its students, teachers, and even the building. 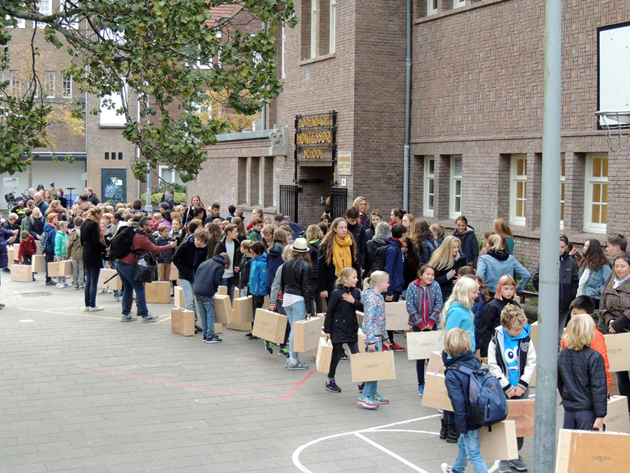 On the school's website, I learned for the first time that 172 students and former students from our Montessori school had died in Nazi concentration camps. I did not start kindergarten there until 1944, but even my older brothers and sisters were unaware of these deaths because the occupation forces had ordered all Jewish children to attend separate schools starting in 1941. Since so many Jewish families had been sent to concentration camps, these Jewish schools were closed in 1943. In a book written by Ronald Sanders about these eventful years at the school (translated into English by Hannie Voyles under the title Storming the Tulips) I found not only a lot of harrowing stories but also a complete list of all the victims. Slaughter of the Innocents (2006). 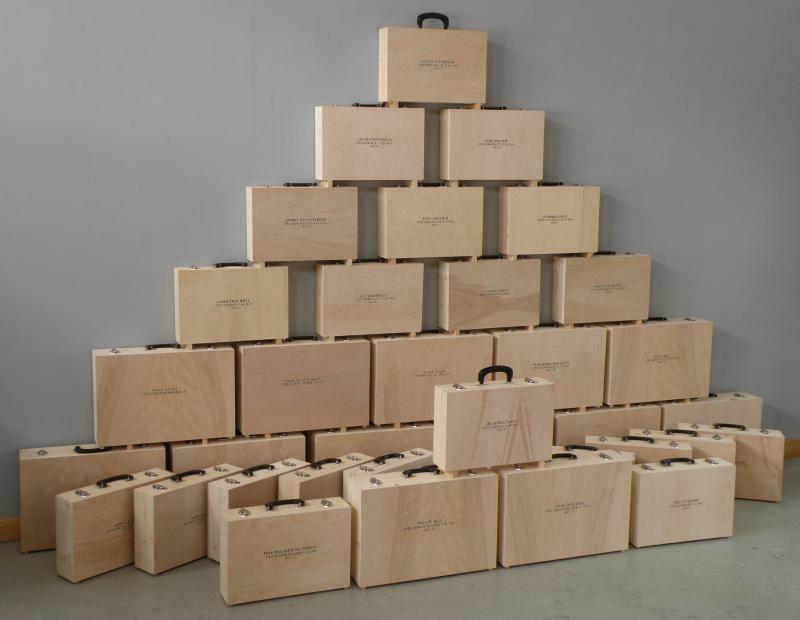 In February, 2009 I began working on a second sculpture, In Memoriam, for which I constructed a wooden suitcase for each child on the list; on each lid I painted a child's name and the date, location and age of death. 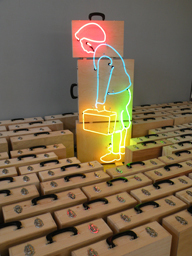 On a stack of three suitcases I mounted a neon image of a stooped boy holding a suitcase. 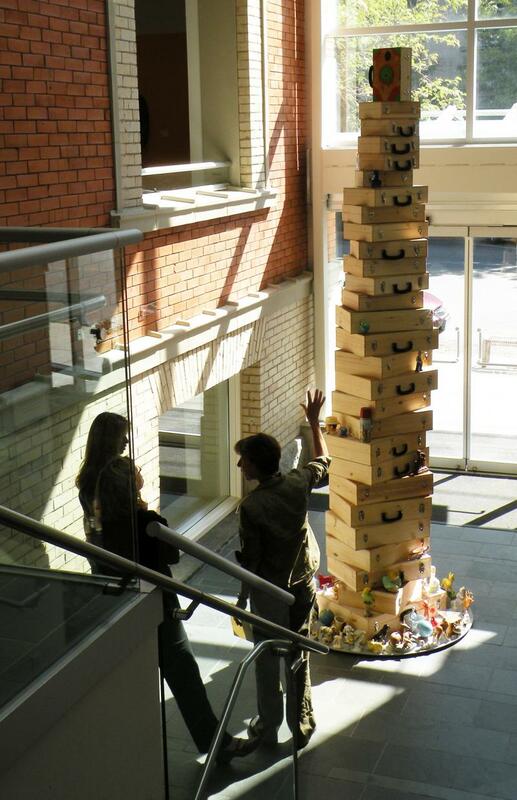 This sculpture was first installed in the Exit Gallery on the campus of Montana State University in October, 2009. In January, 2010 In Memoriam was shown at Bozeman High School. 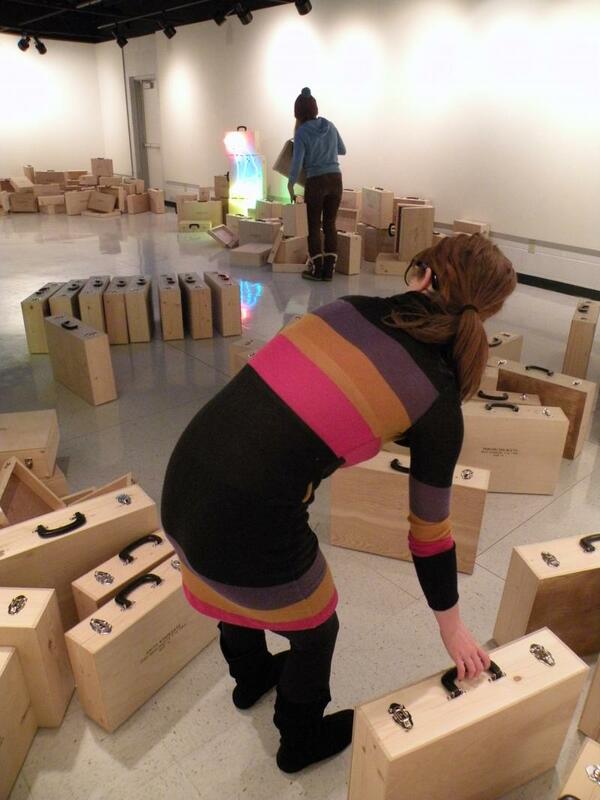 At each venue, I ask volunteers to help determine how to install the work. 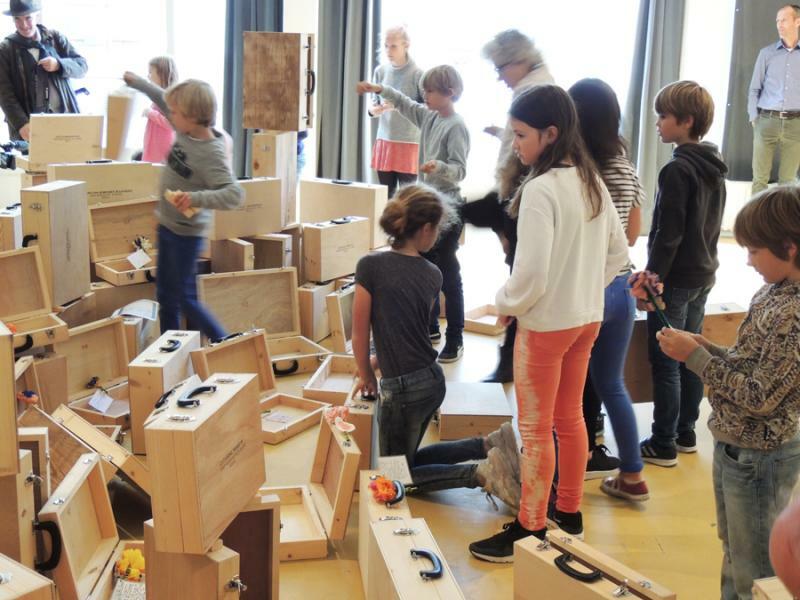 Here, students decided to create five piles of suitcases (some of them open), creating a real sense of loss and abandonment. 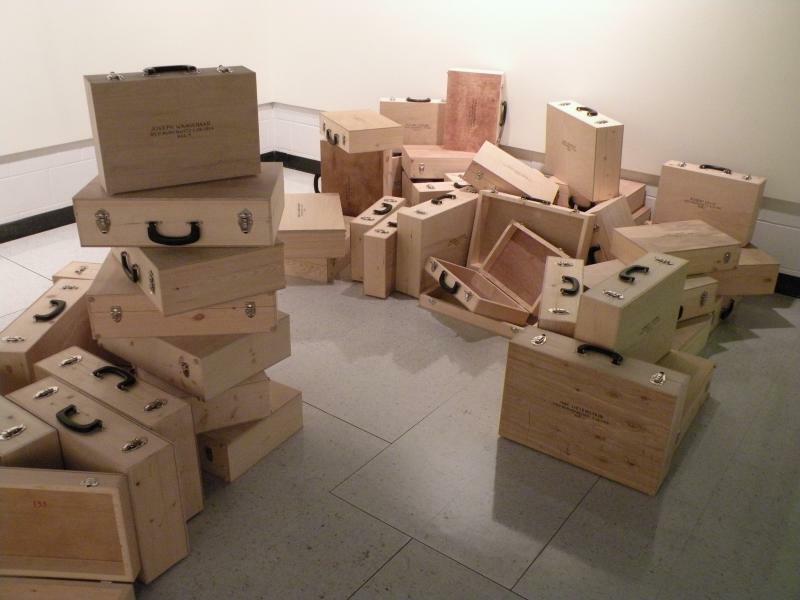 In August, 2010 a group of students at the University of Montana combined open suitcases with seemingly random piles and some small stacks. 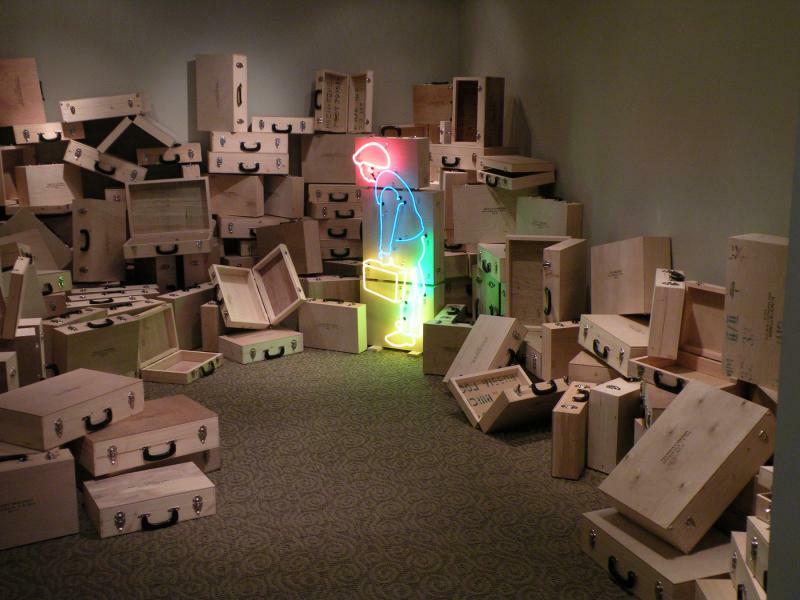 This small, windowless gallery was perfect for suggesting the claustrophobic interior of a storage or baggage room. 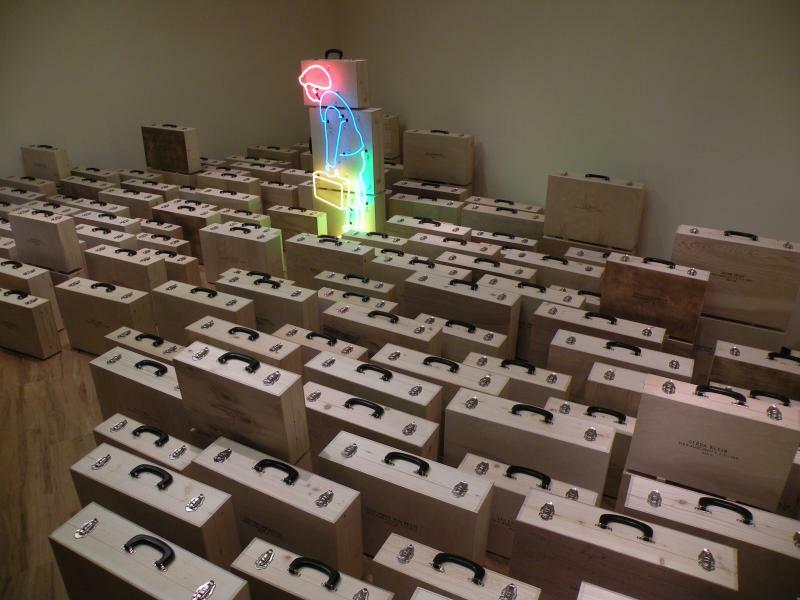 Since 2010, I have built a number of sculptures based on the events that took place during my childhood. 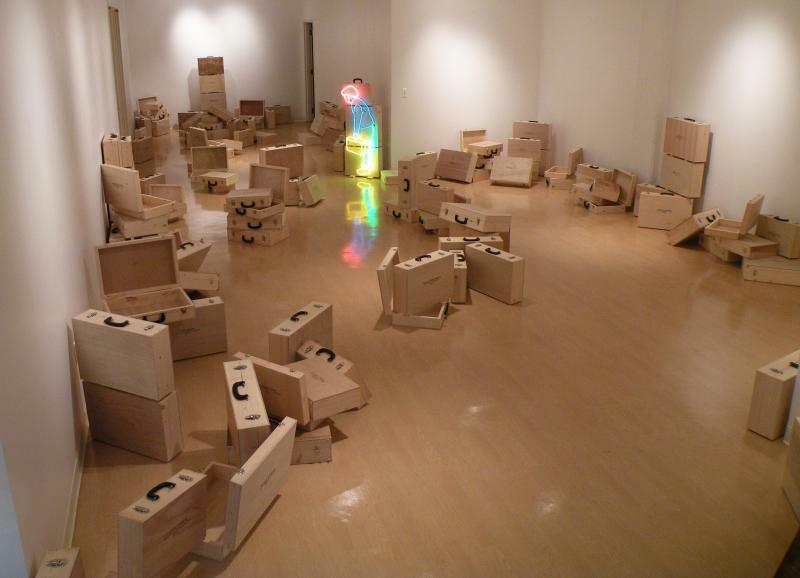 Sculptures from this series have been shown at the Missoula Art Museum and in a solo exhibition titled When I Was A Boy at the Emerson Cultural Center in Bozeman, February-April, 2013. 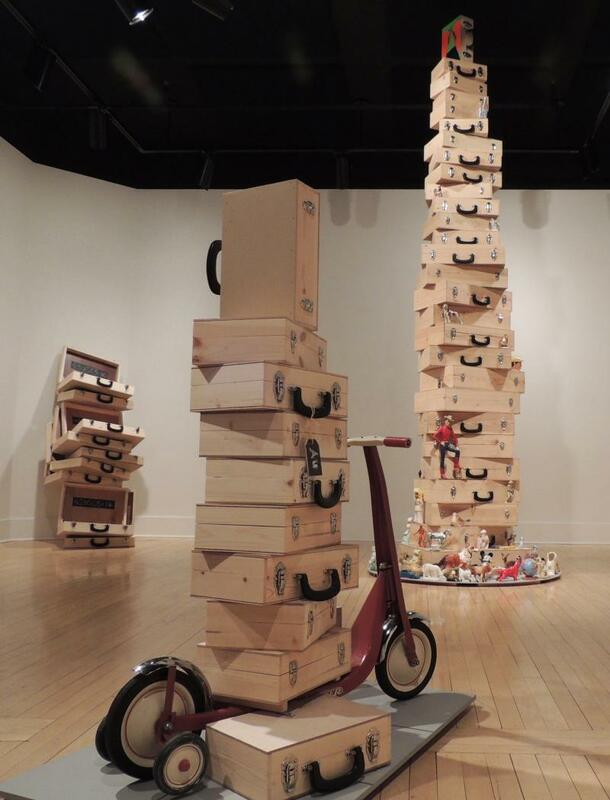 Childhood (Lost) is now on permanent display at the Yellowstone Art Museum, Billings, Montana. 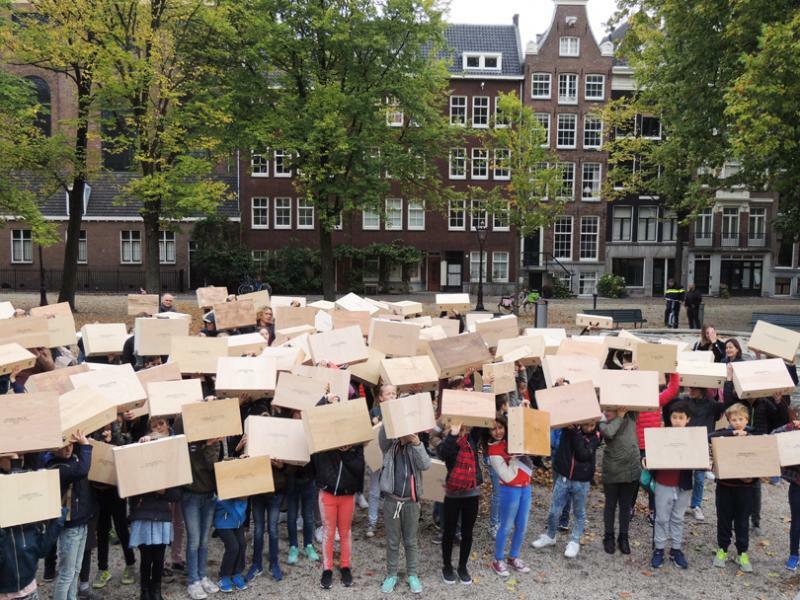 In the fall of 2016 my wife, son and I were joined by students, teachers and parents from the Montessori school I attended and carried the 172 suitcases through the streets of Amsterdam to the new National Holocaust Museum, where the students installed them. On our walk to the museum, we paused in a square from which 425 Jewish men were transported to concentration camps in February, 1941. 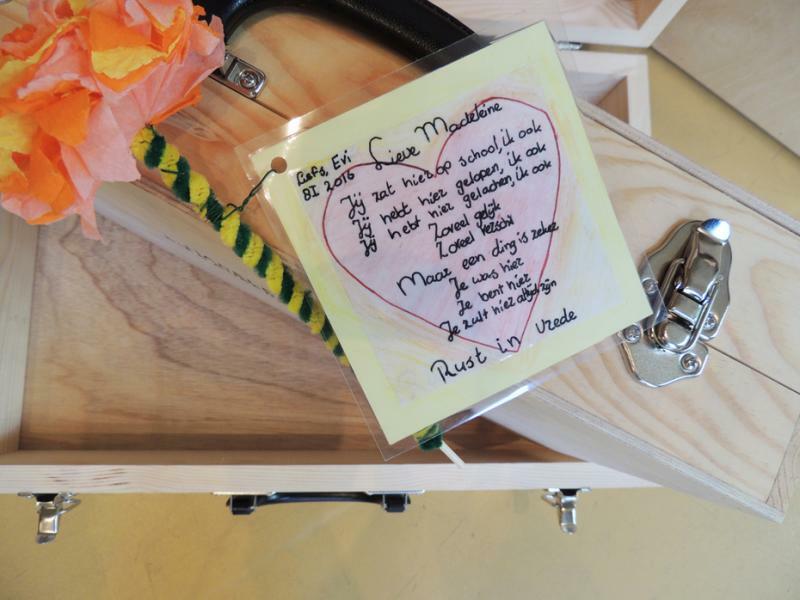 Some of the students had written notes to the victims. This one reads "You attended this school, me too. You walked here, me too. You laughed here, me too. So alike, so different. But one thing is certain--You were here, You are here, You will always be here. Rest in Peace."